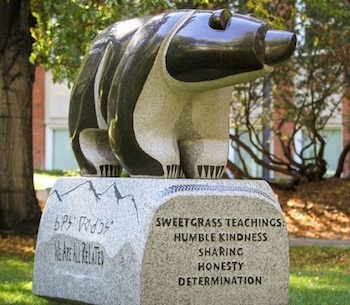 The Sweetgrass Bear, by Stewart Steinhauer, is part of the university’s efforts to work toward respectful, meaningful reconciliation with Indigenous people. Nearly 60 university leaders and Indigenous community members participated in a pipe ceremony Tuesday as the Sweetgrass Bear was unveiled on the University of Alberta’s quad on North Campus in Edmonton. The ceremony was led by Elder Jimmy O’Chiese. August 31, 2016. Nearly 60 university leaders and Indigenous community members participated in a pipe ceremony Tuesday as the Sweetgrass Bear was unveiled on the University of Alberta’s quad on North Campus in Edmonton. The ceremony was led by Elder Jimmy O’Chiese. The Sweetgrass Bear, by Stewart Steinhauer, is part of the university’s efforts to work toward respectful, meaningful reconciliation with Indigenous people. As well the Provost’s Office has undertaken an initiative to acquire Indigenous art. The Sweetgrass Bear is the first of four instalments with an open working committee being established to select the next three pieces, which will be installed at the UAlberta campuses over the next three years.